It looks like I’ve found another author to love. I was first introduced to the work of Jeanine Cummins when her publicist contacted me upon the recent release of The Crooked Branch and asked if I would be interested in reading and reviewing it. I loved that book; haunting, humorous, relatable, gorgeously written, it was a story that still hasn’t left my mind weeks later. I was eager to read more by this author, so I bought her other novel, The Outside Boy, which confirms that Jeanine Cummins isn’t a one-hit wonder. 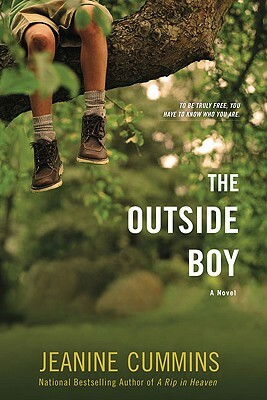 The Outside boy takes place in Ireland in 1959 and is narrated by the outside boy himself, one eleven-year old Christopher “Christy” Hurley, a Pavee traveller, or gypsy, who lives with his family, consisting of his father, grandparents, an aunt and uncle and three young cousins, and whose home is the open road. The story opens with his Grandda’s death, and we are introduced to the Pavee customs and ceremonies surrounding death. Young Christy is a pistol – I completely fell in love with this boy who had me laughing and crying by turns. Cummins’s ability to inhabit the character of an eleven-year old boy and bring him to life to the point where the reader can hear his voice, smell the wood smoke on his tattered clothes and see the dirt on his bare, calloused feet is truly astonishing. In many ways, Christy is like most eleven-year old boys, interested in the things boys his age are interested in, often mischievous and foul-mouthed, but always appealing. But he carries in his young heart a longing for the mother he never knew, and a terrible guilt for having killed her by being born. When his grandfather dies, Christy finds among his belongings a faded newspaper photograph of a woman, a man, and a baby. The woman is his mother – the only photograph he’s ever seen of her. But who is the man? And who is the baby, given that she died when Christy was born? When Christy and his family stop for an extended period in a town during Lent in order for Christy and his cousin to enroll in school so that they may get their First Communions, Christy enlists the help of a kindly bookshop owner to help him unravel the mystery of his mother and his origins. This story is very much about the bonds that cleave us to those we love and those we have lost, and like The Crooked Branch, it’s very much about how our relationships – or absence thereof – with our mothers shape us. It’s given me much to ponder, and I might write about it sometime soon on my other blog. I loved this book and kept turning the pages, again feeling both satisfied and sad to turn the last page. I’m only disappointed that these are the only two novels Jeanine Cummins has written so far; I look forward to reading more of her work in the future.